Famine killed nearly 75 million people in the 20th century, but had virtually disappeared in recent decades. Now, suddenly, it is back. In late February a famine was declared in South Sudan , and warnings of famine have also recently been issued for Somalia, Nigeria and Yemen . 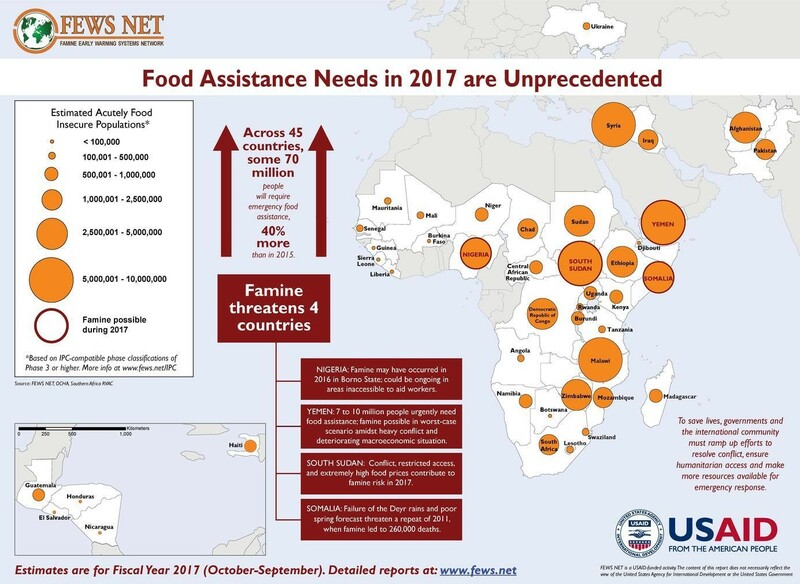 Moreover, in January the Famine Early Warning System (FEWSNET) – a U.S. government-funded organization created in 1985 specifically to predict famines and humanitarian emergencies – estimated that 70 million people affected by conflicts or disasters worldwide will need food assistance in 2017. This number has increased by nearly 50 percent in just the past two years. What explains this rapid rise in the number of people who need emergency food assistance? And why, in an era of declining poverty and hunger worldwide, are we suddenly facing four potential famines in unconnected countries? Famines are extreme events in which large populations lack adequate access to food, leading to widespread malnutrition and deaths. More of these deaths are caused by infectious disease than starvation because severe malnutrition compromises human immune systems. This makes people much more susceptible to killer diseases such as measles, or even common conditions such as diarrhea. Young children are especially vulnerable. - Mortality rates exceed two people per 10,000 population per day. For comparison, a noncrisis rate in contemporary sub-Saharan Africa would be about 0.3. People affected by famine may also experience other impacts, including widespread hunger, loss of assets, the breakdown of social support networks, distress migration and destitution. The last large-scale famines affected the Horn of Africa in 1984-85 and 1992, and North Korea in the mid-1990s. Since that time, only one large-scale famine has occurred: a devastating crisis in southern Somalia in 2011 that killed a quarter of a million people. For many years experts believed that famines were caused by a shortfall in food availability. Then in 1981 economist/philosopher Amartya Sen published “ Poverty and Famines: An Essay on Entitlement and Deprivation ,” which showed that famines actually resulted when food was available but some groups could not access it. Although many people believe today that famines occur mostly in Africa, the deadliest famines of the 20th century were in Europe (Ukraine) and Asia (China). Today we recognize famines happen only with some degree of human complicity. Some analysts assert that famines are crimes of either commission or omission , because human decisions and actions determine whether a crisis deteriorates into a full-blown famine. They also contend that we cannot eradicate famine without holding people who cause it accountable. Famines typically have multiple causes. They can include climatic factors such as drought, economic shocks such as rapid inflation, and violent conflict or other political causes. Their impacts are more severe when underlying factors make some groups more vulnerable. Mortality during famines may be exacerbated by conflict and displacement. Deliberately cutting off access to food is often a means of war. It is not a coincidence that the threat of famine in South Sudan, northeastern Nigeria, Yemen and Somalia is occurring in the midst of protracted, violent conflicts. For example, the 2011 famine in Somalia was caused by a severe drought, a dramatic spike in the cost of food and devastating loss of purchasing power, and conflict. These occurred on top of long-term environmental degradation, deteriorating opportunities in agricultural and pastoral livelihoods, and the absence of a central state authority. One party to the conflict, Al Shabaab , was an armed group that the United States and other countries labeled as a foreign terrorist organization. Al Shabaab controlled people’s movements and access to markets, and excluded or directly threatened many humanitarian agencies. External donor governments prioritized containing the terrorist threat, and warned that any stolen or diverted aid that ended up in the hands of Al Shabaab would be treated as a criminal offense . These policies made it extremely difficult for humanitarian agencies to assist groups affected by the famine. This combination of human-made factors thwarted adequate prevention or response measures until the famine declaration provoked a more vigorous response. By then, the number of people being killed by the famine had already peaked. Not surprisingly, the most marginalized groups within Somali society were the worst affected. Famines are recurring today because once again, conflicts and natural disasters such as drought are converging in vulnerable areas. Shortened recovery cycles between recurrent crises – due partly to climate change – leave ever-larger groups more vulnerable. Famines result from cumulative processes we can observe and predict. That means we can prevent them through timely public action. Early warning systems such as FEWSNET monitor agricultural production and rainfall trends, commodity markets and price trends, and conflicts. They also track trends in food access, malnutrition or mortality, and labor migration among at-risk populations. Governments and humanitarian agencies can use this information to prevent or limit famines. Since the 1950s , food aid has been the main tool for responding to famines. Producer countries ship food to countries in crisis, and humanitarian organizations like the World Food Programme deliver it to affected populations. Now we are paying more attention to protecting people’s livelihoods to help them cope with crisis and recover afterwards. Cash transfers have become the primary form of aid, although the U.S. government also provides food aid. Ready-to-use therapeutic foods – high-energy pastes typically made from peanuts, oils, sugar and milk powder – have significantly improved treatment of acutely malnourished children. Actions in other sectors , including water and health, are helping the humanitarian community prevent and respond to famines. Nonetheless, even when famines and food access crises are predicted, governments, donors and humanitarian agencies often fail to head them off – a pattern known as the “ early warning/late response ” problem. Sometimes it is due to negligence or bureaucratic inertia. More frequently there are political reasons, or armed conflict blocks access to affected populations. And donor nation policies may limit where assistance can go for political and security reasons. Today the situation is urgent. Humanitarian aid budgets have not kept up with needs in recent years. Some governments in affected countries and donor nations are gearing up responsibly to meet this problem. Others are not, or are sending unclear signals. While the U.S. is responding to the current crisis, foreign aid is one of many areas in which the Trump administration has proposed major cuts . Even when enough resources are available, more must be done to deliver it to people who need it. This means working out measures to ensure access before crises deteriorate into famine. National governments and even rebel groups should renew their commitment to International Humanitarian Law , which guarantees civilians caught in conflict the right to assistance, expressly forbids the use of food as a weapon of warfare and provides support for efforts to prevent and resolve conflicts. Timely action based on early warning can avert major crises and save resources and lives – but it requires political commitment and constant vigilance.